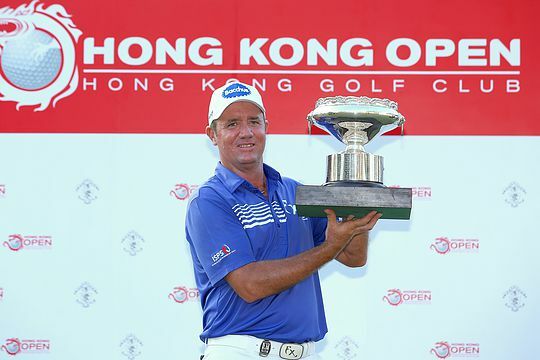 Australian Scott Hend became the first Australian since Greg Norman in 1983 to claim the Hong Kong Open title, following a play-off victory over Angelo Que of the Philippines on Sunday. Hend calmly holed a five-foot par putt at the 18th on the first extra hole at the Hong Kong Golf Club to turn around a disappointing season to date, which has included five missed cuts in his past six events around the world. It was Hend’s sixth Asian Tour victory and his first on the European Tour, opening up a different pathway to the Florida-based Australian who now has exemption in Europe. “I felt quite calm. The only thing is that you don’t want to go for the pin on 18 as you can make bogey quite easily,” Hend said. Earlier, the Australian had saved par from a plugged lie in the greenside bunker on 18 during regulation play to sign for a closing three-under-par 67 and tie Que on 13-under-par 267 aggregate. Que had closed with a fine 66 which included a memorable birdie after hitting his approach to six inches at the closing hole. Ireland’s Kevin Phelan closed with a 66 for third place while England’s Mark Foster was a further shot back in fourth position. Tournament drawcard Ernie Els (69) settled for a share of fifth place on 271 after struggling with a hip injury, tied with S.S.P. Chowrasia (67) and overnight leader Marcus Fraser, who faded with a 72. Fraser, who said a day earlier: “No one is more surprised than I am, that’s for sure, after eight months of sitting on the couch.” Fraser was magnificent in his return from an eight-month injury layoff with a hand injury. Hend will now make the short trip to Macau to defend his Macau Open title on the Asian Tour while Fraser will head to Perth for the European Tour’s ISPS HANDA Perth International at Lake Karrinyup Golf Club.